What do you think is the future of reading? Will it change? Will we move totally from books to electronic devices or something else? Will esteemed authors of the past be relevant to future generations? Will ereaders change the way kids read? 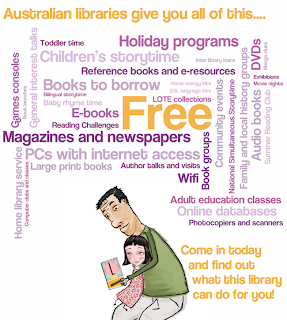 Tell us your thoughts by contacting us on info@thelibraryagency.org.au. We’re writing a report for government at the end of the National Year of Reading and we’re looking for input from the public (bookclubs, writers, teachers, librarians, keen readers and people who have struggled with reading) on their views of the future of reading. Let us know your thoughts by the 20 July 2012. What ten books would get your vote? To celebrate the National Year of Reading, ABC TV’s First Tuesday Book Club is looking for the 10 Aussie Books to Read before You Die – the great Australian reading list! Head to the website to browse the list and vote www.abc.net.au/arts/aussiebooks. The ABC would also love libraries and bookstores to promote this - so just visit our wiki to download the posters and media release.